Memorial Day is that annual occassion that reminds us of the thousands of brave men and women who sacrificed their lives at the altar of freedom and painted the soil of America with the blood of their hearts. TheHolidaySpot gives you a thematic word puzzle activity on this Memorial Day to let you celebrate the occassion in a unique manner. Exercise your brain cells with this awesome Memorial Day Word Scramble Puzzle and have a nice time. If you enjoy solving this Memorial Day Word Scramble Puzzle and want to share it with your pals, click here and pass them on this page. Celebrate Memorial Day with your loved ones and TheHolidaySpot! 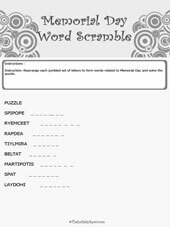 Add to your Memorial Day observances with this interesting word scramble puzzle themed to the occassion. Just take out a print of its template, and unscramble each of the jumbled set of letters to form words related to Memorial Day. Hope you enjoy this brilliant Memorial Day Word Scramble Puzzle! 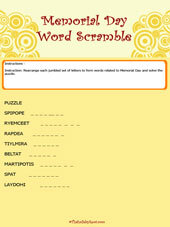 Click on the thumbnail image of the Word Scramble template. This will open it in a bigger size in a new window. Once you have finished printing, close the template window to come back to this screen.